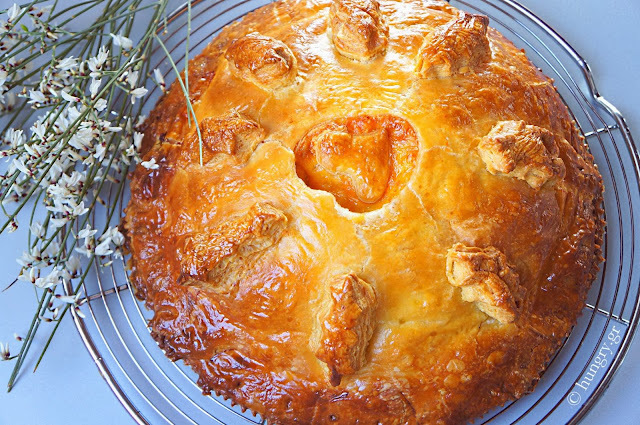 Unique savory pie/ cake with smoked finely cut ham and tasty cheese alternately arranged. 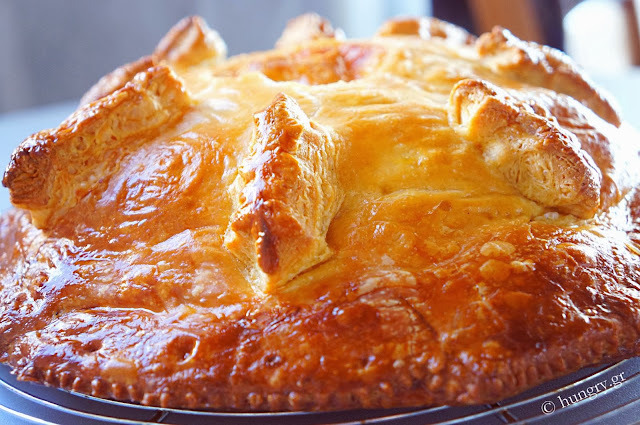 Between the layers a thin coating of bechamel sauce gives, besides taste, creamy and velvety texture. The set wrapped with ruby crunchy pastry. 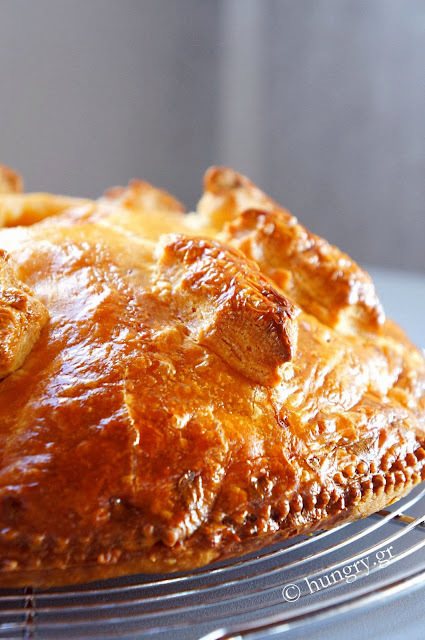 Very tasty, impressive in appearance and definitely irresistible tasty! 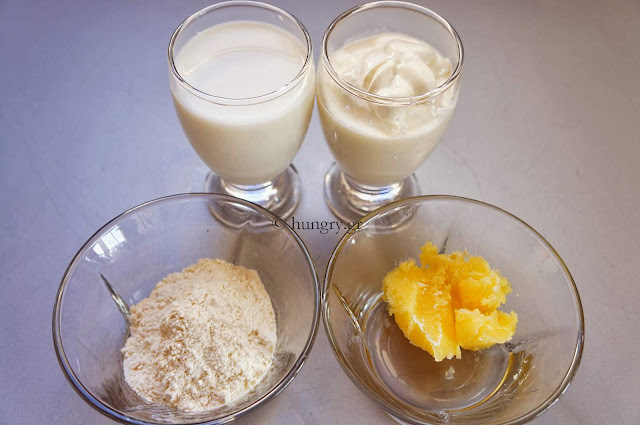 A not low calorie food dish at all but if you want to make and enjoy it as a unique delicacy in some excellent time for you, follows step by step the whole process. Accompany it with a colorful salad and a good wine. You do not need anything more. 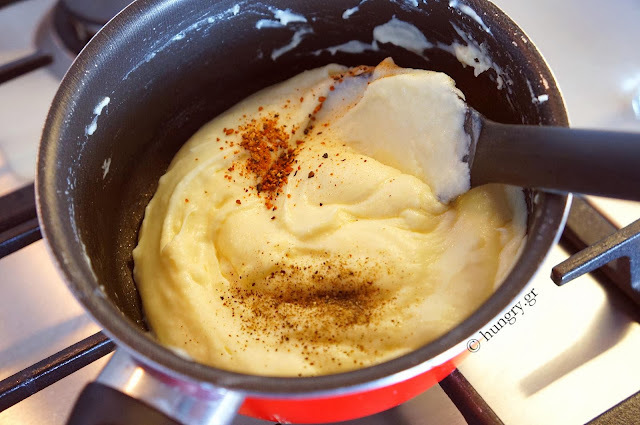 Initially we make the béchamel sauce. 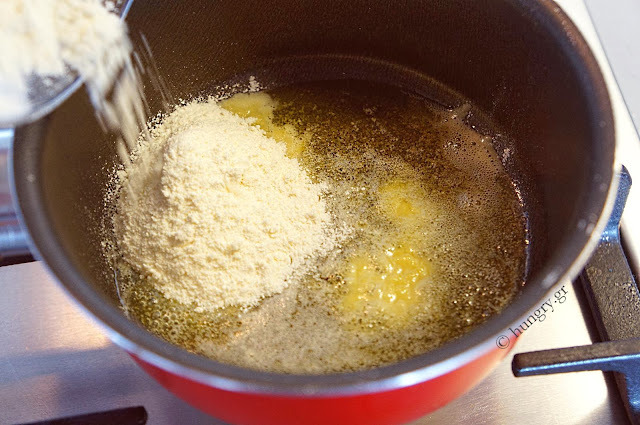 In a small saucepan over low heat add the butter and when it starts to foam, add the flour. Shake a few times but do not let it get color. Add the milk, stirring vigorously and immediately add the cream. Mix. Allow up to get a fire to boil two, 4'-5' and thicken slightly. Season with pepper and nutmeg. We leave aside for a while to cool, stirring occasionally. 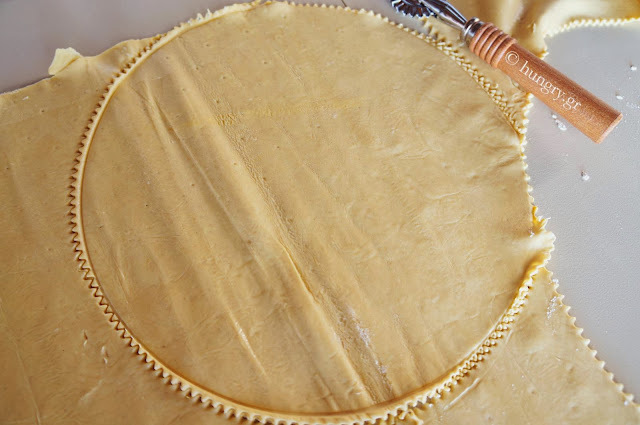 Roll the sheets of puff pastry and cut two disks. One Ø25cm (Ø9.8in) for under and another Ø28cm (Ø11in) on top. Place the large disk level in the fridge until you need him. In a pan lay nonstick paper and touch the small disk. 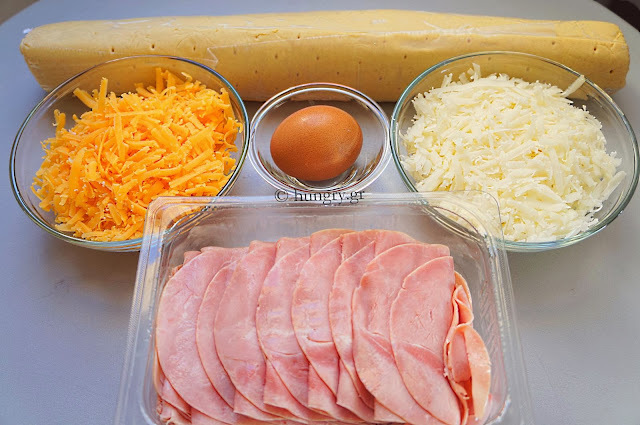 Spread around with beaten egg. At the center of the disc spread, with the back of the spoon, 1-2 tablespoons cream, leaving 3-4cm (1.2-1.6 in) from the circumference of the circle. Sprinkle the top of the cream with a good dose of cheese. 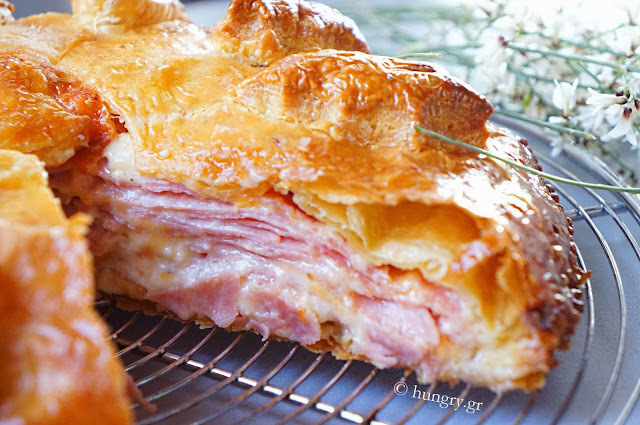 On top of the cheese put the slices of ham and brush with a béchamel sauce layer. 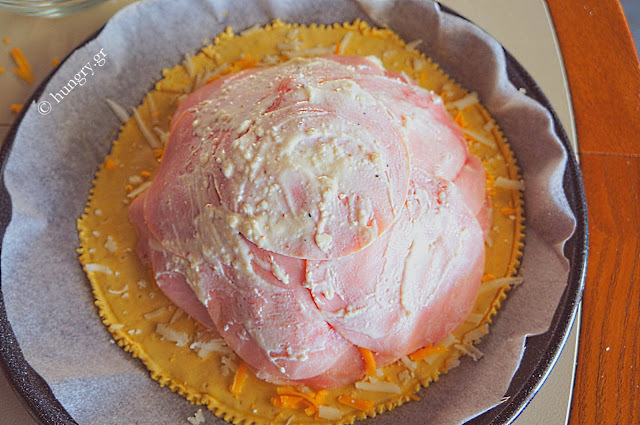 Repeat the same process until all the ingredients are finished: cream, cheese, ham, and have formed a hill. 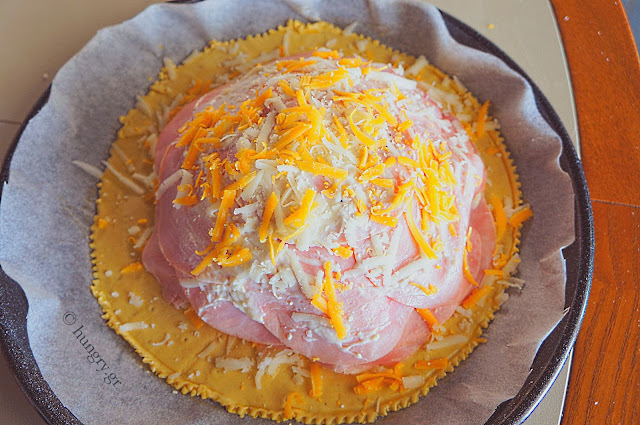 We finish the process with a final layer of cheese. Pick from the perimeter of the bottom tray all the cheese that have scattered there to stick well to the upper sheet. 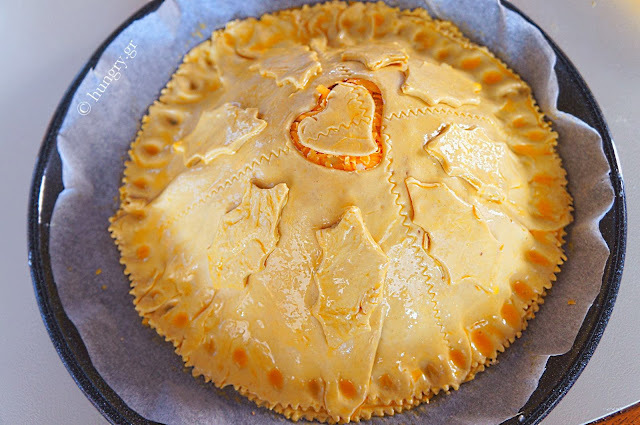 Apply the second sheet, pressing gently on top of the layers. At the top and center open a hole 2cm (0.8 in) for the water vapor. 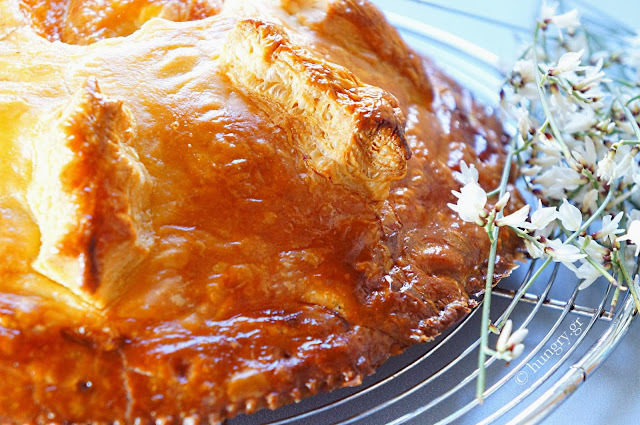 With leftovers of puff pastry cut shapes and stuck them around the hill. With the tip of the handle of a knife press the top sheet around the base, to stick to the bottom. Brush with beaten egg twice. Bake in preheated oven at 200°C (392°F, Gas 5.7) for 30 minutes. Then lower the temperature to 180°C (356°F, Gas 4.2) and bake for another 15'. 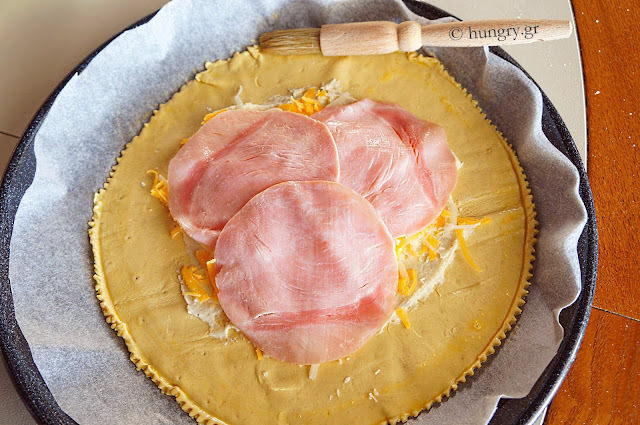 When remove from the oven, let the ham pie 20'-30' before we cut into slices. The hole in the top of the cake is necessary and should not be omitted. Otherwise it may explode during baking. 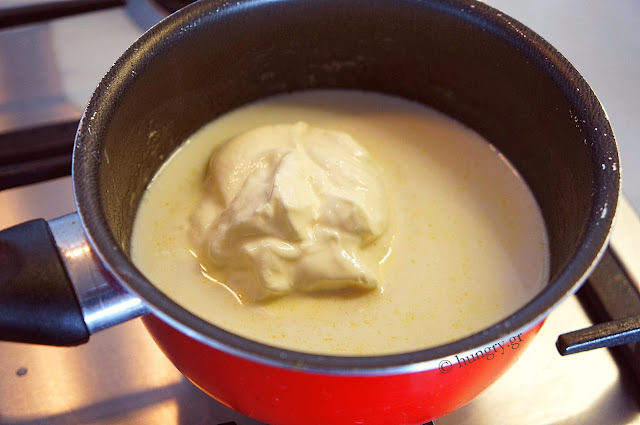 If the béchamel sauce turns quite thick, dilute with a little milk. In the opposite case, boil a little longer to clot. 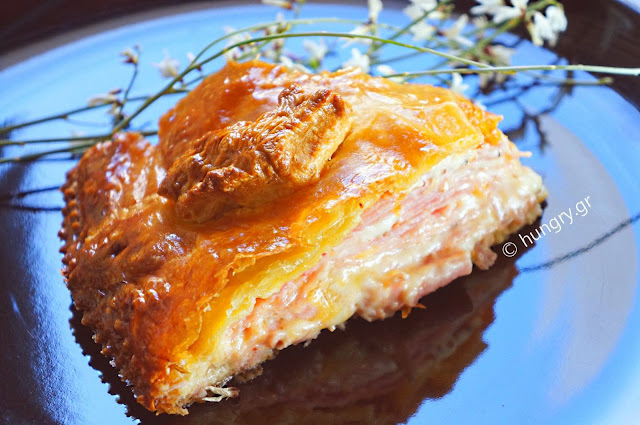 Crispy, pastry phyllo (Kourou), stuffed with delicious sausages, bacon and mushrooms. 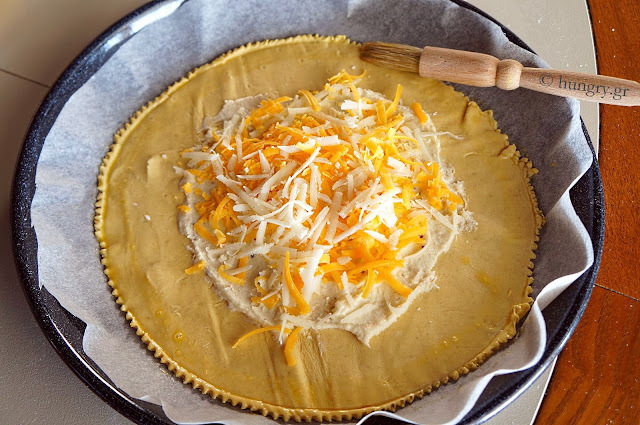 Yellow cheese that melts during cooking and enhances the flavor. Red pepper that gives of a slightly peppery flavor and color! 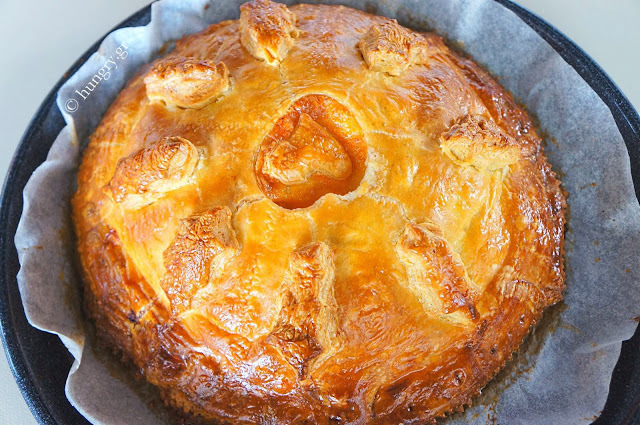 A pie, with delicious ingredients and special appearance. Today we eat fast, delicious and hearty! 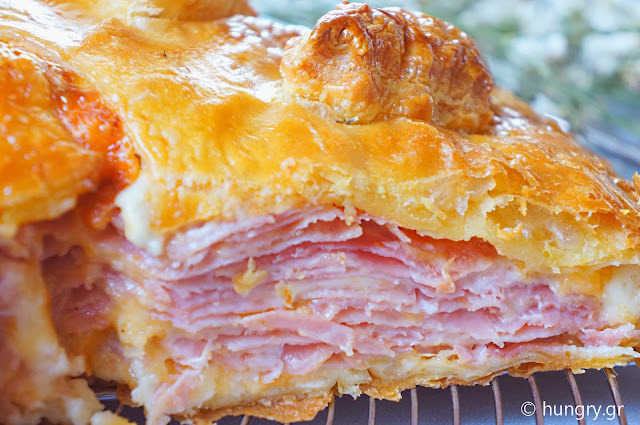 Make a Calzone with puff pastry, a little ham and cheese and we're ready. Without time-consuming procedures and with guaranteed tasty results! Until cooked we can prepare a delicious light salad with red radish and a lightweight vinegraite, to accompany and to ease the calories of the calzone.